Have a look at Academy’s impressively spacious new headquarters. Some rooms are still available for sponsorship. The Blue Devils’ System Blue division has announced its 2017 summer series of educational events, including offerings in seven states. Blue Knights is looking for alums of its many different ensembles to participate in the corps’ 60th anniversary celebrations coming up in 2018. Blue Stars is offering free shipping on all merchandise orders until December 31. Bluecoats is featured in the “People of the Year” edition of “About Starke County” magazine. Aaron Bailey, who works with several WGI Sport of the Arts ensembles, has been chosen to lead the visual and movement staff for Boston Crusaders. If you’ve ever wondered what it takes to build one of the corps’ mobile kitchen trucks, check out this Q&A session with Cadets Hall of Fame member Bill Speakman. The brass instructional team for the 2017 Colt Cadets includes Caption Head Kara Metzger, who aged out as drum major of the Colts in 2015. Preserving Iowa’s history, lumber that was once part of the oldest continuously operating firehouse west of the Mississippi River is going to be utilized in producing doors and desks in the Colts’ new headquarters. Gold composer Scott Director will be creating another original work for the corps’ 2017 production. Guardians will schedule additional color guard auditions at the corps’ April rehearsal camp. 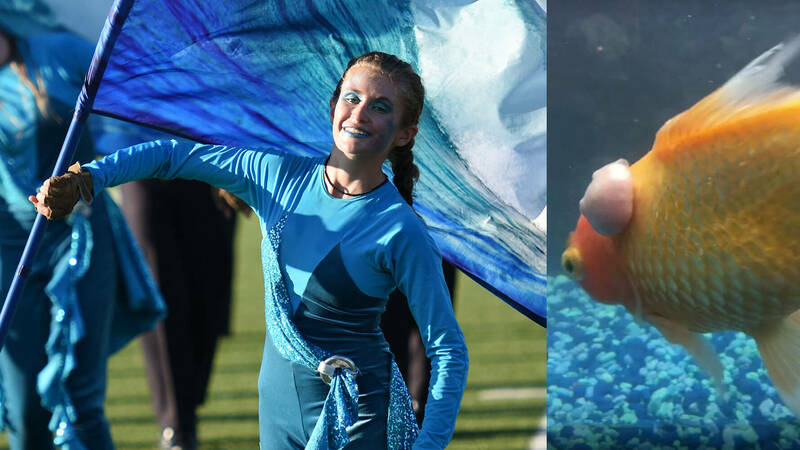 Jersey Surf color guard member Tina Petrillo and her very fortunate pet goldfish Winston were featured in USA Today this month. Tickets are now available for the Madison Scouts’ Drums on Parade DCI Tour event on July 9. The latest edition of “Mandarins Notes” brings us up to date with what’s been going on with the corps over the past year. When you give an online Phantom Regiment gift certificate to someone special, you can receive an additional $25 gift certificate for yourself. The day after Christmas, 245 current and former members of the Santa Clara Vanguard will kick off the celebration of the organization's 50th anniversary, as they assemble in the Bay Area to begin rehearsals for their 2017 Rose Parade performance. Southwind has announced its 2017 color guard instructional staff, including new caption head and choreographer Marsha Foster. Vicki Thiem, a Troopers alum, was on the Lockheed Martin team that helped NASA send the Juno Space Satellite into orbit in July.